Hey, everyone! Today, I have an interview with Elizabeth from Elizabeth Burns Design where we talk about how to renovate and/or flip a house on a budget! So if you’re someone who has an interest in interior design, wants to find a new side hustle, or you simply want to renovate your home on a dime, then definitely check it out! Elizabeth gives amazing actionable and in-depth advice which is why I’m seriously excited to have you read this interview. 1. What first interested you in interior design? I have always loved creating things for as long as I can remember. When I was little, I would come up with ideas to transform spaces in my parents’ house and was constantly redecorating my bedroom. When I was about 12, I saw Trading Spaces for the first time and it just kind of clicked that there was a job out there of doing what I loved. I wanted to be Genevieve Gorder. 🙂 I pursued interior design from there. 2. What first inspired you and your husband to start renovating and flipping homes? What’s the story on how you guys got started? Honestly, it was by accident. When we were engaged, we got our first apartment together and I was really excited to finally have a place of our own and make it feel like a home. Brian got roped into doing a lot of the grunt work like painting and hanging art. When we maxed out the decorating on our apartment, we even started flipping furniture (buying pieces from a thrift store, painting them, and re-selling on Craigslist or at the flea market). I think that’s when we realized we were a good team – I had the eye for design and he really enjoyed executing the idea. We bought our first house right after we got married, and did a lot of little projects to make it more our style. We were broke newlyweds, so we had to get our creative juices flowing to get the look without spending a bunch of money. After we were done with the reno, we had a lot of compliments on the work we did and people thought everything looked more expensive than it was. We sold that little house 5 years later and made a profit of about $100,000. That really opened our eyes to the possibility of working on houses as being more than just a hobby. 3. How do you choose homes to flip? For us, it’s all about the numbers. Whenever we scout out a property, I bring along a very detailed checklist to evaluate all aspects of the home. I itemize each part of a house (siding, driveway, flooring, trim, lighting, cabinets, etc) and classify them as either: good to go, needs repair, or needs replacement. Then once I’m home, I can calculate the renovation budget pretty precisely and we can decide if we want to make an offer. Often we’ll find the house is going to be more expensive to renovate than we originally thought and have to pass. This process is a lot of work upfront but can eliminate a lot of headaches down the road and prevent us from buying a bad deal. For us personally, the ideal flip house is one that is newer construction (1990 or earlier) but just really ugly or gross inside. That way the money spent is on pretty cosmetic things instead of bringing an older home up to code with new plumbing and electrical – things behind the walls. 4. How do you stick to a budget when renovating? The checklist really helps keep our budget in line. I also add 10% of whatever that number is to account for surprises. During the reno, I keep a pretty detailed spreadsheet on everything spent. I have two columns in my spreadsheet – the estimate for an item and then the actual cost once we purchase it. I adjust things as we go to make the final renovation numbers work. For example, if I estimated $2000 for floors but the actual cost was $2500, then I might have to go with less expensive lighting to make up the difference. This method has worked pretty well for us so far. Honestly, we are still very new at this, so I feel like we are always met with new challenges. When we first got started, we lacked the knowledge and skills needed to do quality work. It took a while for us to get the experience and practice to finally feel like we know what we are talking about when it comes to renovating. You don’t become a master of something overnight, so it took years of trial and error to gain that knowledge base. 6. What was one of your biggest mistakes, and how can others avoid it. Oh, there are so many. 🙂 When it comes to flipping, one big mistake we made was purchasing a home with our preferences in mind instead of potential buyers. We love smaller homes (we’ve talked about living in a tiny house someday) but now realize most people don’t view housing the same way we do. Our most recent flip was a two bedroom one bathroom with beautiful original wood windows and within walking distance to downtown (a.k.a. our ideal house). However, the buyers in our area wanted a big house for their family, energy-efficient replacement windows, and lots of land. We bought an investment property we liked instead of listening to the buyers’ desires and therefore the house didn’t appeal to the majority of buyers. It’s important to realize this is a business deal and your personal preferences shouldn’t be a factor. Know your market (a good real estate agent can help with this). It’s important to realize this is a business deal and your personal preferences shouldn’t be a factor. Know your market (a good real estate agent can help with this). 7. How would you suggest someone else gets started in flipping? What would be some of their first steps? 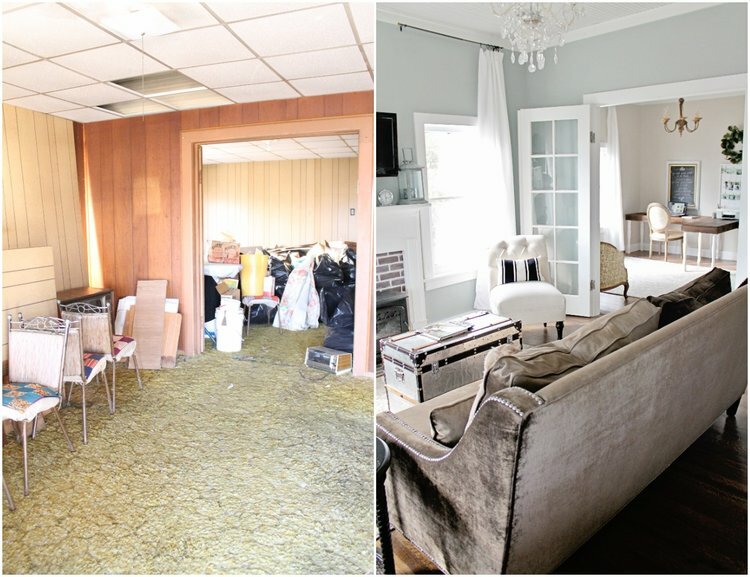 A question I get asked a lot is “how did you fund your first flip?” The way we got started was by doing what’s called a “live in flip.” Basically, you purchase a run-down property in the best area you can afford and renovate it while you live in it. This allows you to purchase the home conventionally (no special loan required) and you can work on it a little at a time as you go. It allows for ample trial and error and a great opportunity to learn hands-on. The other great thing about a live in flip is that if it is your primary residence for at least two years, when you go to sell it, you don’t have to pay any capital gains tax (at least this is true in NC and as long as the profit is under $250,000 if single or $500,000 if married). So the $100,000 we made from our first home was tax-free and we could use that money to purchase another property to flip. 8. How much should someone invest when they first start? I think that really depends on your area. In the small town we live in now, we have purchased homes for $26,000 and $52,000 which I know is crazy low for most parts of the country. I don’t know that I can give a dollar amount to how much someone should invest, but I would just advise not to over-extend yourself and have an exit strategy. I would not invest every dollar from your life savings to make a deal happen because odds are there will be surprises not accounted for. In addition, I would have a plan b if the flip doesn’t sell or doesn’t sell for what you expected it to. Maybe holding onto it and renting for a couple of years would be a better choice financially so have other routes of recouping your investment. 9. What’s your favorite thing about renovation and house flipping? What excites you about it? I love the transformation. My favorite part is when we show friends and family our most recent purchase pre-reno and get raised eyebrows, but then in a few months time they see the final product and they are blown away. It’s really cool in my opinion to see a vision that was living only in my head come to life right before my eyes. I also love handing the keys over to a new homeowner who is just plain excited about the home we renovated. It sounds cheesy, but we pour our hearts into these houses – I design them as I would if we were going to live there, no shortcuts – so it is nice when someone loves our work as much as we do. 10. What’s your biggest tip for potential home flippers (and “if different,” people trying to renovate their home on a budget)? I say it all of the time, but flipping and renovating look SO much easier on TV than it is in real life. Flipping houses is time-consuming, stressful, and crazy expensive (especially at the beginning before you can afford to hire things out) and can really take a toll on your relationships and life in general. I wouldn’t recommend it to anyone who isn’t passionate about houses or is just looking to make a quick buck. You have to be a little house obsessed for the sacrifice to be worth it. If you do fall into the camp of crazy house people (hi friends!) I would just encourage you to be creative, think outside of the box, and re-purpose where you can. It makes the process more fun and your flip more profitable in the end. Focus on making a house feel like a home instead of an investment property. I think it’s the little touches that tug on buyers’ heartstrings and then purse strings. 11. And lastly, do you have any heroes when it comes to fixing and flipping houses? I, like 99.99% of Americans, am slightly obsessed with the work Joanna Gaines does. She has such vision and it’s been fun to see her design style and creativity develop over the years. In general though, I have a lot of respect for the people that actually do the hard work. The design aspect is what I think people love to focus on, but the skilled tradesmen and craftsmen that do the heavy lifting (literally) to make that design a reality amazes me and deserves more credit than they get. If you have any questions about this interview, feel free to leave a comment down below!